CiiNOW, the cloud gaming technology provider in which AMD invested, posted some benchmark results comparing the latency of their AMD powered cloud gaming platform to NVIDIA GeForce GRID cloud gaming technology powered cloud gaming platforms Gaikai, which was acquired by Sony, and Taipei, Taiwan based Ubitus. The last opponent on the benchmark chart is Microsoft's Xbox 360 home gaming console. Recently CiiNOW's vice president of marketing and publisher relations Chris Donahue claimed that CiiNOW's cloud gaming technology named Cumulus is faster than other cloud gaming platforms and enables an immersive gaming experience that is faster than playing on a console, and they intend to prove that claim in an article by their CTO in Q1 2013. Not surprisingly the benchmark conducted by CiiNOW favours CiiNOW by a large margin, easily beating even the local Xbox 360 console. You can see the CiiNOW latency benchmark results below. Using Mass Effect 2, CiiNOW beat Sony's Gaikai with 132 ms to 180 ms, being 27% faster. Using Super Street Fighter IV: Arcade Edition, CiiNOW beat Ubitus with 133.5 ms to 259.2 ms, being 48% faster. Finally using F.E.A.R. 3, CiiNOW beat the Xbox 360 with 100 ms to 120 ms, being 17% faster. Same PC, TV, Cable, Network, Game, Game scene. Ping time measurement while gaming. High speed 240 fps camera. Shot the scene from button to action. Taken multiple latency measurements and then average. Normalized results based on server distance. Each frame is 4.166 ms.
CiiNOW vs. Ubitus test performed using public servers in South Korea. As always, benchmarks made by one of the participants of said benchmark should be taken with a grain of salt, and it's better to wait for independent benchmark results. As opposed to Gaikai and Ubitus, CiiNOW's cloud gaming technology isn't yet used in any commercial cloud gaming platform, so these results are kinda moot and should be seen only as advertising for potential customers of CiiNOW. 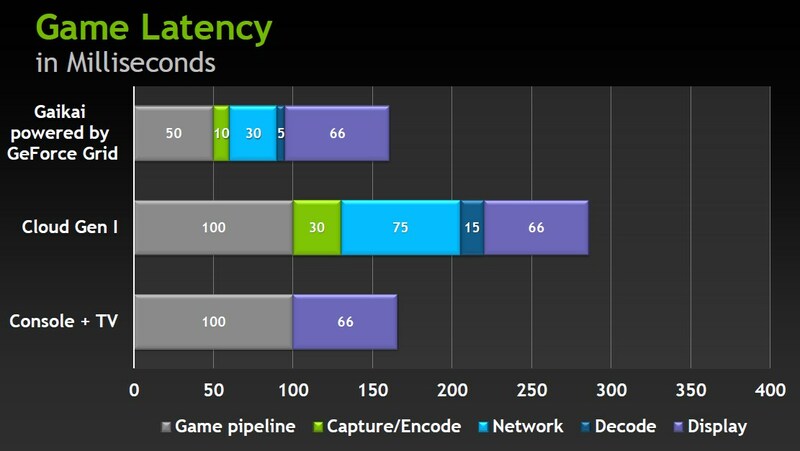 For comparison's sake, below are benchmark latency results of Gaikai cloud gaming powered by NVIDIA's GeForce GRID cloud gaming technology that were provided by NVIDIA during the unveiling of GeForce GRID back in May of last year. Their result of 161 ms wasn't far-off from CiiNOW's benchmark result for Gaikai and they were also faster than consoles. Again, these benchmark results should be taken with a grain of salt. NVIDIA's GeForce GRID cloud gaming technology is already well underway to cloud gaming data centers of Sony's Gaikai, Ubitus, Playcast and the likes. We should get a sneak peak at the as of yet unannounced cloud gaming GPU from AMD that is powering CiiNOW's Cumulus cloud gaming platform at CES 2013 next week. Occasionally the GPU benchmark wars between NVIDIA and AMD get very ugly and bizarre, so interesting things could lie ahead for the opening cloud gaming benchmark front between NVIDIA and AMD.